Infinite Jigsaw Puzzle. 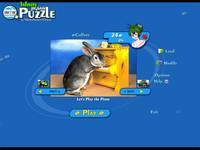 Free download Jigsaw Puzzle game. Jigsaw playing has never been so cool! The game will bring you lots of fun and pleasure completing hundreds of stunning jigsaw puzzles. Test your eye for tons of picture sets and a varying number of pieces for you to select. You can choose any level of difficulty, from a quick and simple puzzle of 24 pieces, to a challenging 1040 piece cut. Besides that, you can enter your own digital pictures of friends and family as puzzles! We have no player reviews for Infinite Jigsaw Puzzle yet.